Part of the main allure of any Disney vacation for children at Disney World is watching the classic Disney Characters perform on stage in front of Cinderella Castle at the Magic Kingdom. During the Christmas Season, the characters put on a show with comedic performances of the Nutcracker and Christmas Caroling in “Celebrate the Season”. Celebrate the Season is performed throughout the night at Disney’s separate Christmas event at the Magic Kingdom during Mickey’s Christmas Party three times a night at 7:45 pm, 10:05 pm and 11:20 pm. The Christmas Party is held on select nights at the Magic Kingdom November 9th, 2012 through December 21st, 2012 and then during normal park hours December 22nd, 2012 through December 31st 2012. Celebrate the Season stars the classic Disney characters of Mickey Mouse, Minnie Mouse, Pluto, Donald Duck, Santa Goofy, and Chip and Dale as they dance and sing Christmas songs in about an 18 minute performance. Some of the songs mix in Disney scores along with classic Christmas Carols such as Gloria and an original “Santa” song to the tune of “Mr Sandman”. On stage with the characters are dancing reindeer, teddy bears, and white horses. 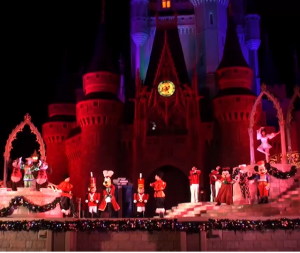 About midway through Celebrate the Season, the characters do a comedic performance to the traditional music of the The Nutcracker with traditional ballet being performed around them (see picture above). Celebrate the Season ends with classic carols being sung with Mickey and Minnie singing “Deck the Halls”, Chip and Dale singing “Jingle Bells” with Minnie, Mickey and Pluto singing to “Rudolph the Red Nose Reindeer” and all of the group singing “Frosty the Snowman”, and “We Wish You a Merry Christmas”. The final carol performed is “Happy Holidays” as a single pyrotechnic effect shoots out from the castle to conclude the performance.